New Book, New Clients, New Year! 2018 is just getting started, and we're having some great new adventures already. The PL Summit Contest is in Full Swing! We’re looking forward to 3 full days jam-packed with inspiring keynotes, amazing workshops, and robust networking opportunities. Attendees will be joined by our first keynote speaker, George Couros, an innovator and expert in the field of education. We’re looking forward to seeing you in San Francisco in May. If you register today, you can save $100 off the price of registration. Join us in shaping the future of learning together! We are so excited to kick off work this month with 13 schools across four districts in Georgia: Bibb County School District, Dougherty County School System, Muscogee County School District, and Savannah-Chatham County Public Schools. Each school applied to be part of a personalized learning program in partnership with the OneGeorgia Authority, the Governor's Office of Student Achievement, and with the support of Education Elements. Over the next ~18 months we will work with district and school teams to assess their readiness, develop their visions, and design new instructional models. We will also provide professional development, coaching, and support. We can't wait to get started! We are excited to announce the upcoming release of Anthony’s new book entitled “The NEW School Rules” at the end of January. Come and get a preview of the book this month at FETC in Orlando, FL or at TASA in Austin, TX by meeting with Anthony Kim or Managing Partner David Irwin. Contact ta'darrell@edelements.com ASAP to book a conversation. Stay informed or pre-order today. Education Elements Holiday Dance Recital! In 2011, Geekie’s founders embarked on a mission to provide a life-changing learning opportunity for Brazil’s students. Since then, approximately 5 million students have had the opportunity to transform their lives through the teaching technology they have developed. Geekie believes that the power to learn is the key to any transformation, as by learning people can overcome barriers to see possibilities they did not know existed. With this technology platform well on its way to transforming students’ lives, Geekie is ready to take its mission to the next level by developing the team’s capacity for personalized learning. Recently, we delivered a Foundations Workshop for Geekie in São Paulo. During the full-day workshop, the team emphasized the “why” of personalized learning, explored the “what” that makes a difference in students’ learning outcomes, and examined the many avenues of “how” to implement personalized learning. With the support and resources utilized with the Train-the-Trainer model, (similar to what we have been doing with other services districts in the US, such as with the NY BOCES), the Geekie team had a chance to learn and apply their learning during the Readiness Assessment they had with Brazil school teams later in the week. 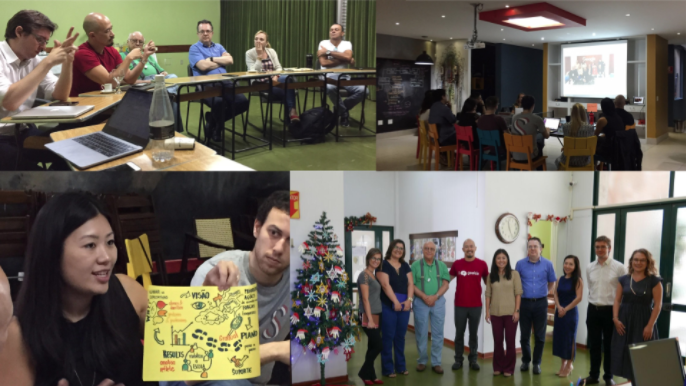 The Geekie team led so many great conversations anchored around the Core Four elements of personalized learning – and it really clicked with the school teams in Brazil. What global momentum around personalized learning! We are so excited to be Geekie’s partner in this journey. When we started the Bring Your Own Thoughts blog, our goal was simple: write good stuff to help good people do good things for kids. And so far, it's been working. In 2017, we published blog posts from our team, our districts, and thought leaders from across the country, ranging from examples of personalized learning in real classrooms, to how to think differently about the purpose of curriculum, to how to change the mindset of a district, to why we do what we do (and why we have made some changes to what we do!) and beyond. As we prepare to transition to 2018, it’s a great time to take a step back, reflect on the year, and express our sincere gratitude. This year has been a meaningful one for Education Elements; we have expanded our reach, developed new offerings, and, most importantly, learned so much from working alongside passionate educators and students. Here are some highlights.